Home / Entertainment News, Gossip and Drama, Videos / That moment when UHURU got irritated by his ADC, he nearly gave him a hot slap (VIDEO). That moment when UHURU got irritated by his ADC, he nearly gave him a hot slap (VIDEO). Thursday, September 13, 2018 - Cameras rolled and recorded President Uhuru Kenyatta clashing with his Aide De Camp (ADC). 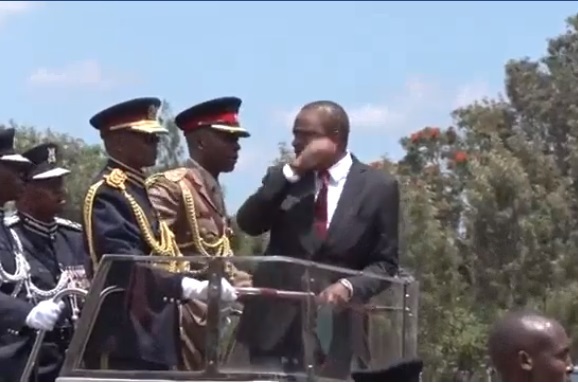 In the video that has gone viral and excited netizens, the ADC is seen trying to get something off Uhuru’s suit when he was preparing to ride on the ceremonial Land Rover. Apparently, the ADC who has since been replaced had noticed that there was something that had stuck on the President’s suit. The clearly irritated Uhuru turned back, threw his hands in anger and the ADC backed off. He nearly gave him a hot slap.